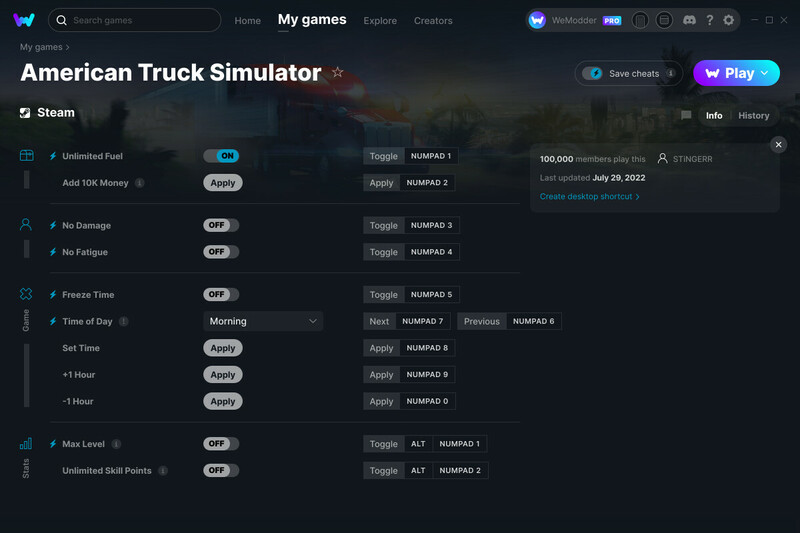 This is the official discussion topic of the American Truck Simulator Trainer and Cheats in the WeMod app. Please post any suggestions, bug reports, or praise that you may have for the cheats in here! These mods are for x64 version of the game. Some mods work, some don’t. Any time I try to set the time, it crashes. +$10k works fine, as far as I know infinite fuel works, no damage, no fatigue work. I haven’t tried freezing time. But the infinite skill and max level do not work, and I crash when I try to change time. No Damage, Add 10k and Unlimited Skill Points all work for me. The rest do not. (Unlimited Fule, No Fatigue, Freeze Time, Become Max Level and Set Time to Morning). Infinite fuel Haven’t tried it. No damage Already have a mod that does this. No fatigue I can toggle that on/off in the preferences setting in-game. Freeze time Haven’t tried it. Add 10K money Work’s great no issues there. Max level Can’t seem to get that to work and i don’t quite understand Max Level: View your Progress History for this mod to take effect. How/where do i look for that? Maybe a instructions manual or video. Change time of day Haven’t tried it. All cheats do not work. I do not know if this issue is just me but when I spam the money thing nothing happens, along with other cheats like no damage. Please fix! @STiNGERR none of the cheats seem to currently work, would be nice to have them working. Cheers! None of the cheats work. I have tried all of these cheats and only 1 of them works for me. The money cheat appears to not be working? I hear the noise when I push the button, but the money doesnt go up in game. Is there a specific page I need to be on? I’m not sure what I’m doing wrong. Thank you for the help!